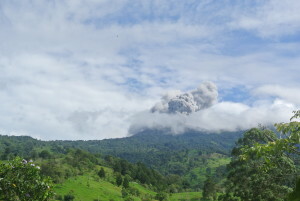 The Turrialba gave us some spectacular volcanic eruptions during the past few days. Thus Don Rolando Pacheco, a neighbor of ours gave us two impressive photos he took from La Central at around 2500mt on the Turrialba Volcano. This village is at around 2 to 3 km from the crater of the volcano in a straght line. On this first photo you see the cone and an ash eruption. 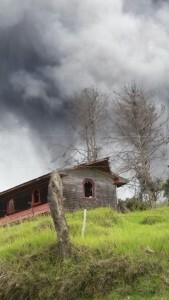 And on the second photo you see an abandoned stable, with the ash and gas eruption behind it. Ovsicori, the Volcanological and Sismological Observatory of Costa Rica, has been registering tremors and some activity in the Turrialba Volcano last week. The direction of the winds were mostly towards the Central Valley. Also from the lodge the views of the volcanic eruptions were quite impressive. So, I have included some photos here for you. 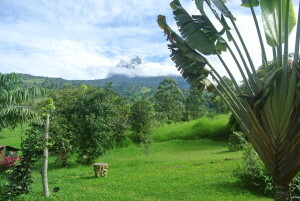 The four photos taken from the lodge show the Turrialba volcano erupting from a distance of about 8km in a straight line, at a height of 1500 mt. This is where the Guayabo Lodge is situated. 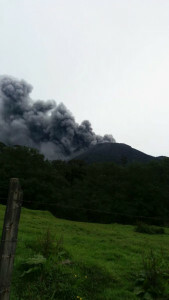 So you see the volcanic eruption from different angles of the garden. 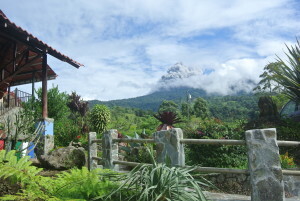 In the first two photos you see the volcano from the front entrance of the lodge. Also, you see bromelias, ferns and different plants. The third and fourth photo have been taken from an other part of the garden. And in the last photo a traveller’s palm (Ravenala madagascariensis), which is family of the strelizia, commonly called in Costa Rica ‘Bird of Paradise’ (Ave del Paraiso). 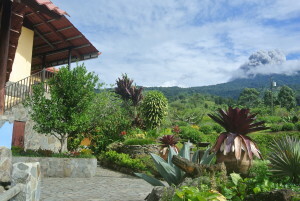 The activity of the Turrialba Volcano has become more visible during the past 7 years and now frequently ‘adorns’ the Guayabo Lodge’s gardens with its volcanic eruptions.